Cookie’s book has empowered me to chart. She has a section in the book that shows how to chart from written directions. 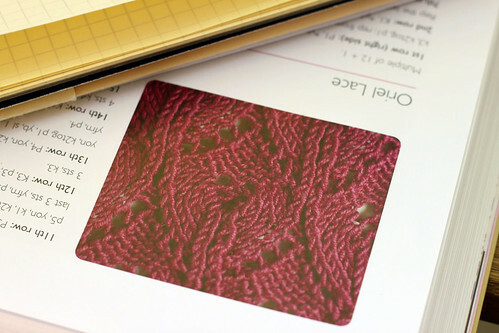 Needing a blog post for today I looked through the Interweave Press “Eyelet and Lace Harmony Guide”. I came across the stitch pattern called Oriel Lace on page 254. It is 12 stitches wide, so perfect for socks. The repeat is 28 rows, really the last 14 rows are just the previous 14 staggered. I think that it looks really fun for socks. The upside-down arch would be a pretty ending for the toe. 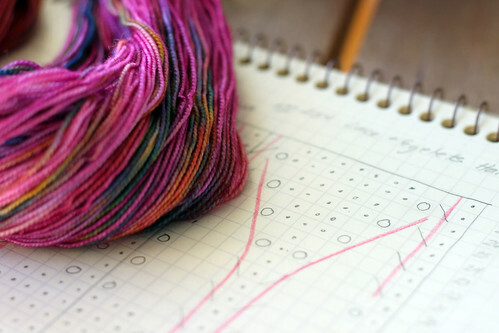 I will knit this pattern in the pink sock yarn I bought on Sunday. I don’t think I’ll ever buy a sock pattern again. “Sock Innovation” is the only book I will ever need to make one of a kind socks. I am starting to think the principles of sock design will work for fingerless mitt designs too. I may never buy a pattern again. Who am I kidding? I just thought of a name for this sock design. “Falling Arches”! Now I will have to knit a sample and post the pattern. This entry was posted on Friday, May 8th, 2009 at 3:00 am and is filed under Knitting. Tagged: Knitting. You can feed this entry. You can leave a response, or trackback from your own site.